You might have noticed that mobile phones are everywhere - and appear to be surgically attached to people's hands! Mobile phones are great communication tools. Increasingly, they double as hand held computers which search the internet, download, store and play music, and provide all manner of news and information. Today there are over 5 billion mobile phones in the world. South America boasts more subscriptions than people, as many have two subsciptions due to coverage issues. Over 70% of South American homes now have at least one mobile. 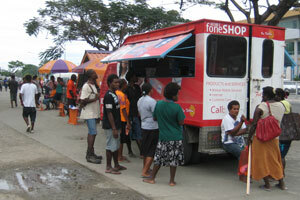 This figure is 40% for PNG and over 50% for the Solomon Islands and India. Several African countries have a mobile phone penetration rate in excess of 70%. This provides GRN with a massive opportunity. We have audio recordings in over 6,000 languages. With so many people now owning a device which is capable of playing those recordings, our challenge is to get them onto their phones and listening. 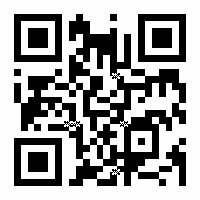 Any mobile with internet access can go to this site and download our recordings. James Thomas, a GRN Australia staff worker, is developing an Android application in partnership with a team from Taylor University, and an iPhone application with California Baptist University (both in the US) along with volunteers in Australia. These 'Apps' will make it easier for people to download, play, and share our recordings. 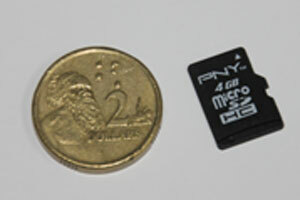 Many mobile phones can be fitted with a microSD card, which is a form of data storage. These cards are small, and yet can store all of the GRN audio recordings for a language. The owner of the mobile phone only needs to insert the card into their phone to be able to listen to the GRN materials in their own language. With the price of these cards continuing to fall, they look like they will be an increasingly powerful and relatively inexpensive means of distributing our materials. They can be particularly effective in closed countries due to the private nature of listening on a mobile phone. For example, an evangelist recently visited St Petersburg Russia with an outreach team to migrant workers. They took a laptop and a supply of micro SD cards, and were prepared to produce materials in 125 different languages. Over the course of their outreach, they gave away over 200 memory cards in 15 different languages. People were excited to receive the messages in their own language and often came back for more - to give to family and friends. We thank God for opening the way for us to distribute our materials so easily and we see amazing opportunities. 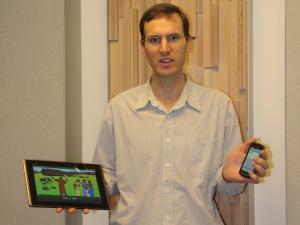 We are thankful for the team that is working to make our materials readily available via mobile phones. That people would find our website and download the recordings. Pray that our Lord would use these recordings to bring people into his kingdom and build them up in their faith. Please pray for James and his team - that they would release Apps soon which give people the best possible access to our materials and make sharing them easy. Please pray that people will realise the great potential of micro SD cards and use them well to spread the gospel. Pray that we would have wisdom and be able to make the most of the opportunities that have presented themselves. Pray that our Lord will use mobile phones and our recordings to advance his kingdom. Download this article as a PDF, for printing or viewing.